Technology has entered pretty much every realm of our lives and revolutionized how we do stuff. Health and fitness programs have been great beneficiaries of these technological developments with different types of assistive gear developed. Such gear is meant to plan and track the achievement of dietary and exercise goals. This review looks at one such gear that has proven popular with many fitness enthusiasts- the Fitbit Charge 2 HR. A detailed insight into its features, price, performance, and other users’ experience to help you decide if this is the right gadget for you. 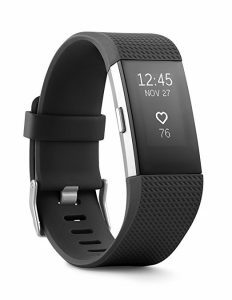 What is the Fitbit Charge 2 HR? This is a fitness tracker that is worn on the wrist and used to track heartbeat, calorie burn, and physical activity stats. It can also be used to guide relaxation sessions using a guided breathing feature and track sleeping durations and quality of sleep. A silent alarm is also inbuilt. A Fitbit Charge 2 HR is worn either during workouts or routine all-day tasks. The tracker is synced to a computer or mobile device from whose dashboard fitness goals can be set, tracked and analyzed. Once syncing is done, it sends data to the device which uses history to compare performance against the set targets. A Fitbit account also allows users to network with friends and can thus be used for group challenges. When you order a FitBit 2 HR, your delivery box will contain two items: the wearable tracker and its charging cable. 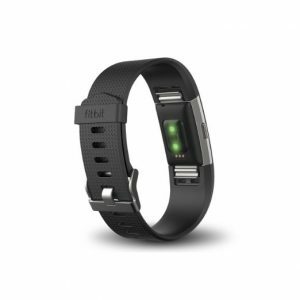 The tracker consists of an OLED screen and a removable wristband. 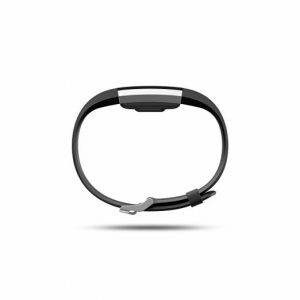 The band can be changed to fit a user’s preference, but each delivery comes with just a single band. Extra accessories need to be bought separately. The OLED screen contains sensors that are used to pick signals from the body and take actions as programmed from the dashboard. It is powered by a rechargeable Li-ion battery which comes as part of the delivery package. The tracker is water resistant. A PurePulse feature helps to pick the heart rate and determine how active the wearer is at the moment. A GPS connection allows the tracker to trace entire movements made during the day to come up with the number of steps walked in a day, the number of stairs/floors climbed, total distance covered, duration of activities and number of calories burned. It also maps the route used for a run/walk/ride. There is also an alert feature for texts, calls and calendar events, meaning users do not have to take breaks to look at their phones. A reminder-to-move feature alerts the wearer when s(he) has been inactive for too long in a bid to have them take 250 steps in every hour of the active part of the day. The screen display is large and touch-controlled to minimize the distraction a wearer gets from their current activity when checking stats or progress. It can be set into different modes for different sports like hiking, cardio, and biking. The removable strap can be styled according to a user’s preferences. Most users who have used the Fitbit Charge 2 have reported getting separate bands for exercise and formal work-day activity. The Fitbit Charge 2 takes into consideration wearers of all sizes. The trackers are categorized into two: small and large. Small trackers range from a wrist size of 5.5-6.7 inches. Large wristbands range from 6-7 -8.1 inches. At 1.28 ounces weight, the Fitbit Charge 2 is arguably one of the lightest wearable trackers. It fits well on the wrist and is unlikely to get in the way of any exercise or posture. The strap has an equal width to that of the screen making the tracker appear like just a simple wristband when worn. Straps are complete with no holes for breathability but this can be changed with extra accessories. Fitbit 2 charge trackers are available in six colors on Amazon- Teal, Lavender Rose Gold (special edition), black, blue, plum and gunmetal (special edition). The first step upon receiving your FitBit Charge 2 HR tracker is to set up an account. Do this by first installing the Fitbit app. The tracker is connected to your preferred device (iOS, Windows or Android) using an automatic Bluetooth connection. On the account dashboard, you input your personal attributes like height, gender, and weight. These enable the tracker to gauge calculations like stride length. With the account up and running, you can then set up your goals on the dashboard. The tracker will receive your settings and record data during activity. Regular syncing (once a day is recommended) will enable the app to receive and analyze recorded data. It will then give you a report on your progress. Fitbit recommends different wearing styles when exercising and when engaging in a routine activity. During exercise, it is recommended you wear the tracker at least three finger-widths behind the wrist bone. This allows a stronger heart signal since there is more blood flow higher up the arm and also little distraction caused by wrist movement during changing exercise poses. On a normal routine, the tracker should be worn a single finger’s width away from the wrist, just like you would wear a wristwatch. You get to set your dominant hand when setting up your account. This can be changed at any time. Waking up a dimmed screen can be done by pressing the button, double tapping the display or turning the wrist as you would do when viewing time on a wristwatch (Quick View Mode). The mode of choice is picked in the settings panel. The price includes shipping for buyers within the United States. A separate shipping fee is included for shoppers in other regions. A protection plan of 2-3 years can be made for between $8 and $ 12. Rinse the strap after every use with water or an alcohol cleaner. Avoid other cleaners which may irritate the skin. Always allow straps to dry before re-attaching. Large OLED screen means you don’t have to stop activity to monitor progress. Quick View mode allows a user to activate dim screen without touching the screen. A number of users felt that the materials used to make both the straps and the display give it a cheap look. They insist that for such quality the band should sell at a lower price. The Fitbit charge 2 HR is a perfect tracker for people looking for performance above matter. While a case can be made for its stylishness, people out for that sleek look may find it a bit plain. People who sweat a lot might consider acquiring a separate breathable strap. Overall, the Fitbit Charge 2 HR works great for just about anyone whose main focus is performance tracking.